This is the first bar - it's in D major in 4/4. The problematic beat is in the red border, the same formation is repeated in the next bar. RH plays a triplet, so each beat is split into three tones. LH, I think, plays it like the beat is split into four tones and the first and the last is played. Should this mean that the last chord of the triplet is played a little bit earlier than the last note of the left hand in one beat? Or did I miscalculate and they play together? 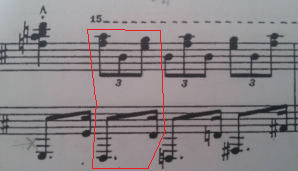 If they do not play together, what is the rhytm of RH+LH playing together and how can I learn correctly the distance between the last note of RH and last note of LH in one beat? Also, does such formation of two notes in LH have a name in English? I remember it had a name in (my native) Czech because it's a very common formation (though I forgot that too). It's written out well, as you can see the semiquaver does come after the third triplet, physically on the music, and actually when played. R.H.- one beat is split equally into three. L.H.- one beat split into four. So the first chord is together, then the two R.H. parts, followed by the L.H. Best way to learn is get each hand sorted separately, so it's automatic, then fit them together, but be careful that the last L.H. doesn't become like another triplet note in time - it's shorter than that. If it's really difficult, you could count 12, with the R.H. playing on 1,5 and 9, L.H. on 1 and 10. Slowly at first, working up to proper speed. Having listened to it, you could get away with making the L.H. triplets too. It's so quick that it could actually be that. What a piece, what a player! If HE wrote the dots out, then that's what HE wanted, but it could be someone else's transcription. It really depends. In baroque music, durations are taken a bit more leniently and the execution might warrant synchronizing the left hand to the right (however, the whole left-hand phrase needs to be self-consistent as does the right-hand phrase). Particularly when singing, a dotted rhythm might be a notational convenience in even meters, with triplets only written out when there are indeed three notes to a beat. In music later than that, you are expected to play as written. Which indeed makes the left hand come in a bit later here but without accenting either of the not-quite-synchronized notes unduly. Takes a lot of practice, probably best done by extensively practising both hands separately at first.